Now, a couple of things to note… first, this place has a hot water shower (the water heater is in the hallway and you have to ask to have it turned on about 20 minutes before you need a shower… but it still has a hot water shower, which is a luxury here). Darjeeling suffers from water shortages, so many of the “budget” places will only provide buckets of hot water for bathing (which isn’t all that bad as long as the water is warm). Second, budget hotels in India rarely provide soap or towels. I bring my own soap (which I with me in my toiletries bag inside of a small plastic bag). I used to have a two different towels, a nice quick-dry microfiber one that I brought with me and a beach towel that I bought in Ibiza. But the quick dry one was stolen in Cairo and I left the beach towel behind in Moshi after my Kilimanjaro climb, as after seven or so days of not being able to be fully dried out it got a tad stinky. So what do I use for a towel you might ask? Simple… one of the two pillowcases (there are always two pillows). It’s a trick I picked up in Goa when I realized that no place that I was going to be staying provided towels (places where one pays more money than I was willing to pay provide towels). Third, you just shower right in the same place as everything else in the bathroom, the water goes on the floor and drains down a hole in the floor (which you can see in the bottom right corner of the platform that leads up to the toilet). Funny enough, as I was writing this post, I almost forgot to add this part about simply showering in the same room as everything as it has become relatively normal for me. For you all, I’m sure, the piece de-la-resistance is the toilet. 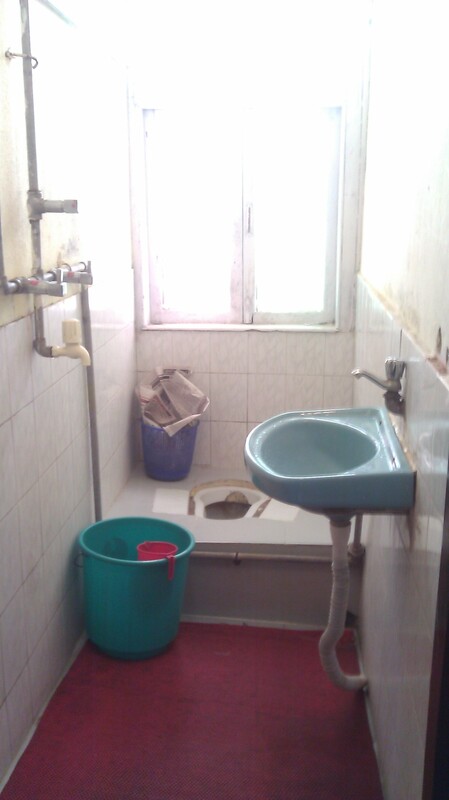 Now, this style toilet is not uncommon in India, but most hotels do have “western” toilets. And note that, in general, toilet paper is not provided. The way things work is that after you do your… ummm… business… you fill the little red pitcher (hanging on the inside of the bucket in the picture) with water. Then you reach around yourself and start to pour while using you left hand to… ummm… wash (which is why, in many countries, you’re not supposed to eat with your left hand and shake anyone’s hand with your left hand). This can be a tricky maneuver… especially in a moving train. You, of course, wash your hands afterwards (which is why I always carny my own soap, or purell, around with me, as it’s not always available). Now, you can use toilet paper (which I generally do after performing the procedure above), but then you have to throw it all in the bin the left of the toilet. To flush, you fill that big bucket of water and pour it down the drain. Easy-peasy right. How is this different from other places in the world… well, not much actually. Ethiopia was more of less the same, but without the water and pitchers (you always carried toilet paper with you, and every street seller sold those little rectangular 12-packs of tissues for virtually nothing). Tanzania was smart, as the water attachment was a pressurized nozzle on a flexible hose (like your kitchen sink attachment , which made things a whole lot easier… and they had western style toilets (but no toilet paper). One other thing to notice… see that the sink drains through a hose that simply pours out on the ground toward the shower drain… this is something I’ve only encountered in India. So there you go… I’m sure you many of you were at least curious. Oh My Gosh, the way you describe your journey’s is such a hoot and to think of what you go through to experience it all.. I’m laughing as I read and the tears are flowing from your descriptions. You seem to have caught on as to how things work. Another great read and another thanks.